Pokémon trainers Trevor Noah and thestarsarewaiting. Celebrities, they’re just like us: They also think that it would be a great idea to go down by Riverside Park so you can get away from the Zubat and Rattata (literally, the worst). Enough of you ground rats and air rats! 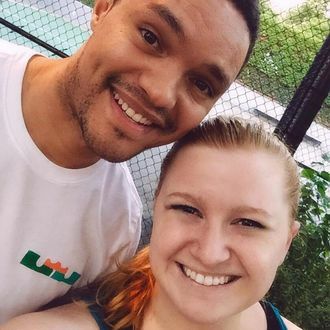 Reddit user thestarsarewaiting went over to the park to see if she could catch some water-type Pokémon, and instead she ran into fellow Pokémon trainer Trevor Noah, who was also on a quest to catch ‘em all. “He looks at me, looks at my phone, and goes, ‘You know there’s a scyther right over there,’” she writes. “I, trying not to freak out because I love him and the Daily Show, then continue to chat with him about the Pokémon I’ve caught. Come to find out, it was him who set the lures in the first place so he could catch ‘em all on his break. He was incredibly nice and very into the game, and had successfully caught that killer scyther that ran away from me (so was probably above my level 17).” And faster than you can say “pic or it didn’t happen,” she has the receipts! Just look at those dimples: A Caterpie would fall right into them.